Throughout the 8th grade school year, I lost my passion for reading. I had this pretty hard Language Arts teacher, who would make us read certain books or a certain amount of books. Personally, being forced to read does not make me want to read. So, boredom buster 2: Find a good book and read it. How might I find a book? I am going to share with you First & Then. (Without spoiling, of course) But you can read whatever you want. I’m just sharing for those who might be interested in this book. First & Then is narrated by a girl named Devon Tennyson. Devon is in her 12th grade year at Temple Sterling High School. She is best friends with a guy named Cas, and happens to be silently crushing on him. All was well until Devon realized that she doesn’t have a serious plan for college. To make matters worse, she has to deal with her cousin Foster suddenly coming into her life. When Foster’s surprising talent causes him to no longer be a social outlier, the popular and attractive Ezra comes into play whether Devon likes it or not. This book has many twist and turns to keep you reading. I think a book must have some closure at the end, if it is not a series. The story of Devon’s last year in high school does have nice closure. I 100% recommend this book and I hope you read and enjoy this book. School’s out and Summer is in. As much as I am happy that I can sit around and watch TV throughout the day, I still find myself to become quite bored. In the GA heat it can become pretty hot. So, what’s better than a nice popsicle? I don’t know about you but one of my absolute favorite treats is cookies n’ cream anything. 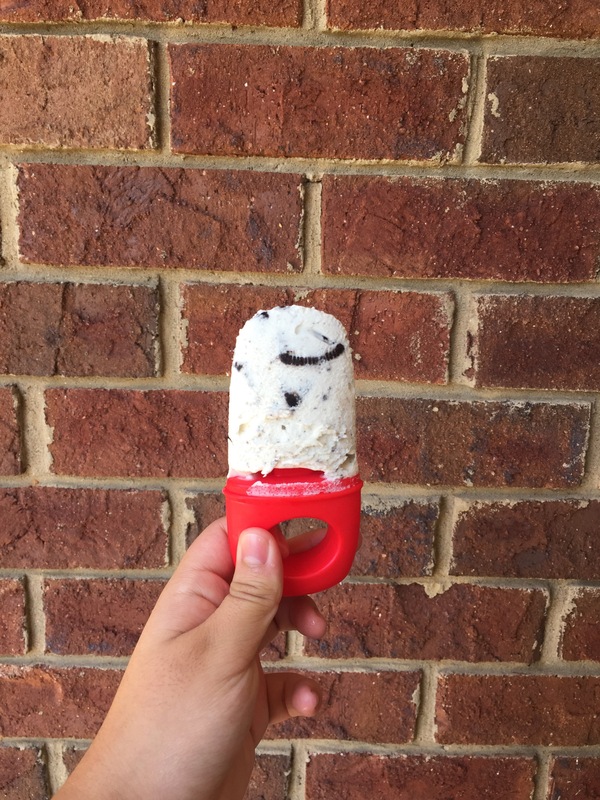 Today I am going to show you how to make a cookies n’ cream Popsicle. This popsicle is inspired by a Buzzfeed video I saw on social media. 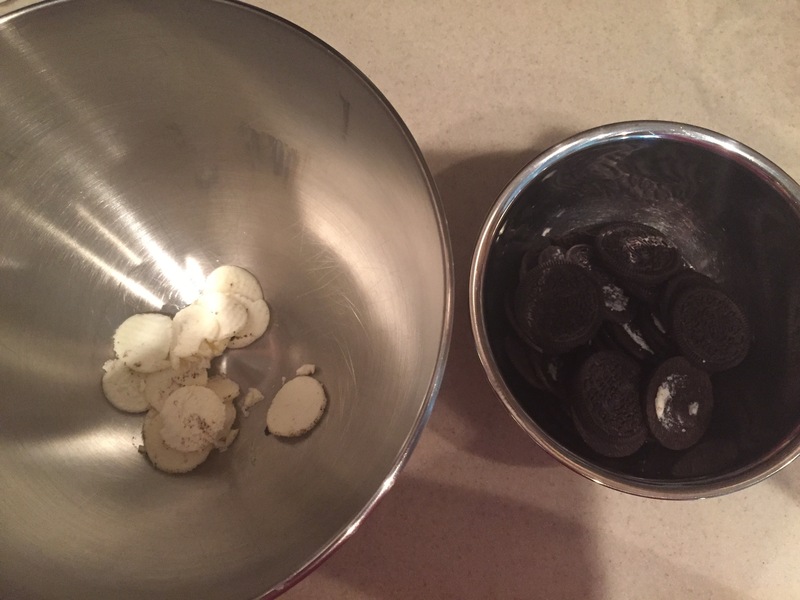 First, you will need to take about 15 oreo’s and separate the inside from the cookie. I used a knife to slide off the filling. Next, you need to crush the cookie part of the Oreo. These are going into the popsicle molds later, so you can make them fine or not. 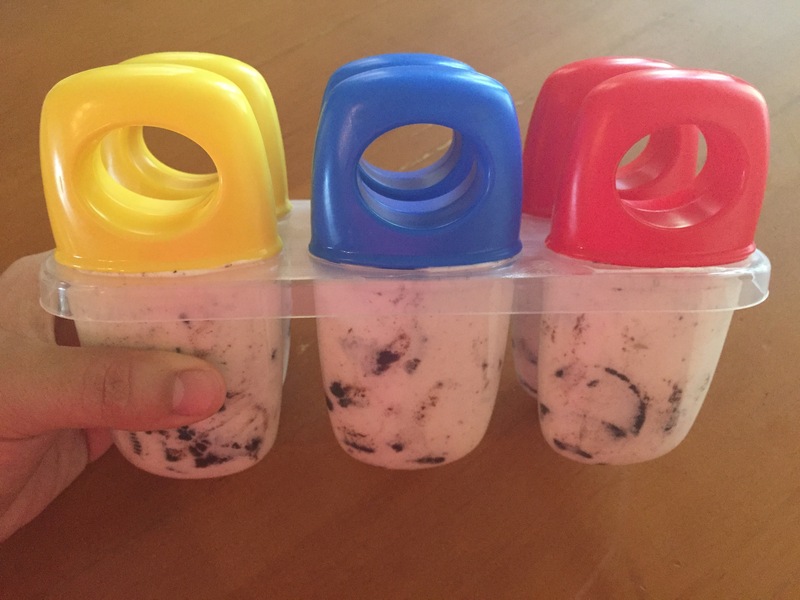 But, consider the fact that with Oreo chunks, it will be harder to put the mixture into the mold, and to put the tops on. I did mine in chunks, but I wish I had crushed them finer. I used the same knife from before to make the chunks. 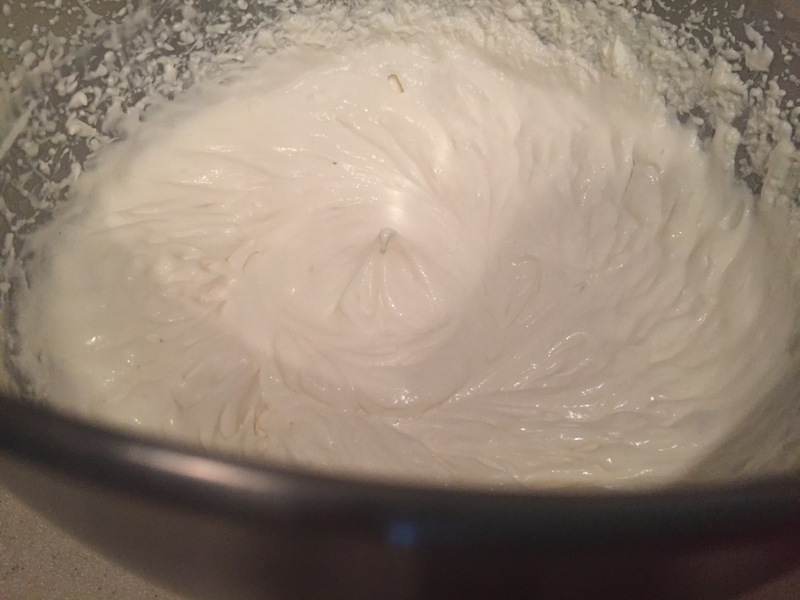 Medium peaks mean that when you raise your mixer out of the bowl, the peak top will fall over slightly, as shown in the picture. The peak is not stiff, meaning it stands upright, but is not soft, meaning it falls out of shape almost immediately. This peak does slightly fall, but still holds the shape of a peak. When they are done, you might need for run the mold under some hot water to help release the yummy popsicles! You are left with a delicious treat that will cool you down from the heat! This is Buck. 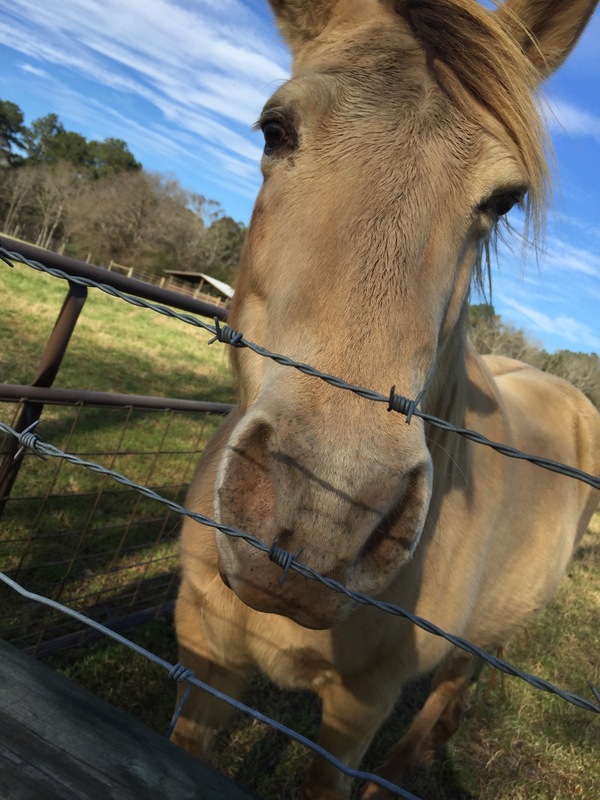 He is one of the most friendly horses you will ever meet. He even gives you kisses… sometimes. 😉 Buck is found on Hedgerow Farm. This farm is run by my Aunt and Uncle. So, about once or twice a year, we visit. And about once or twice a year, we get to see this sweet face. Not only does Buck let us feed and pet him, he also has given us rides. Whether they are rides in the beautiful woods, or rides around his very own dirt track. Buck is an animal that stays in your heart and makes you relaxed and happy. Until then, I am going to share a quote I enjoyed with you guys. “The essential joy of being with horses is that it brings us in contact with the rare elements of grace, beauty, spirit and freedom.” – Sharon Ralls Lemon. 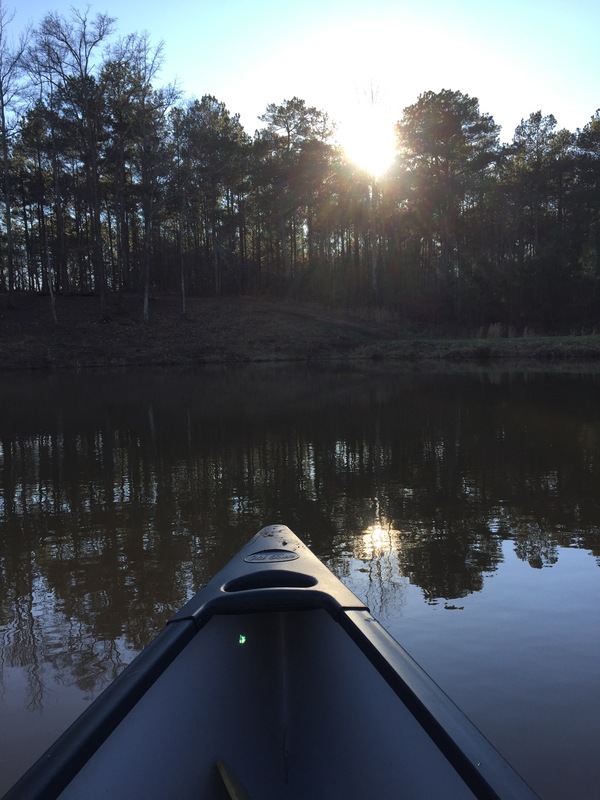 Do you get bored during the Summertime and need something to do? Well I have the answer! 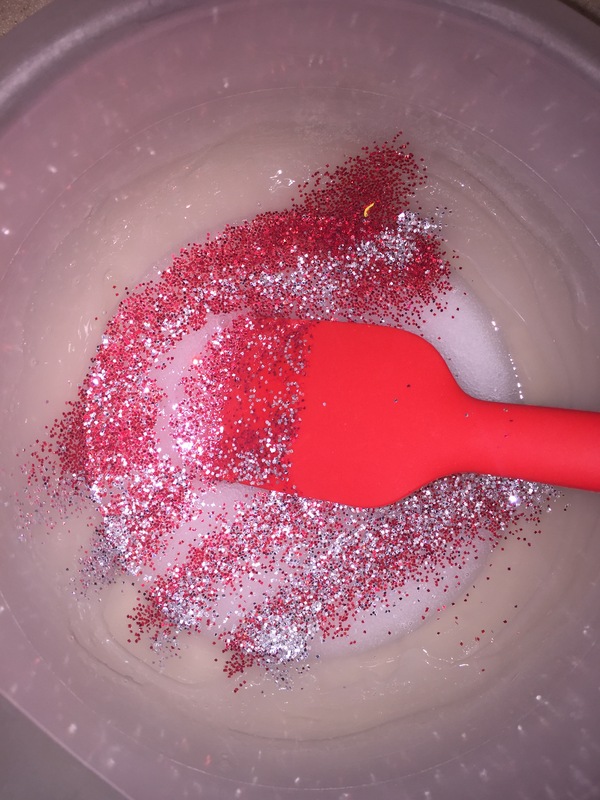 You can make this glitter slime in 3 simple steps. Or so the recipe said. This slime was much more complicated than I had originally thought. 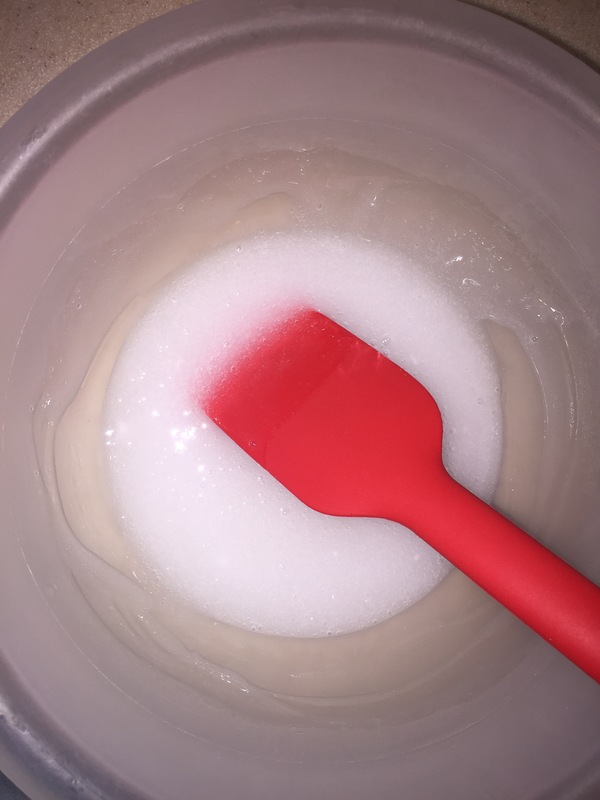 But through experience, I will share my tips about how to make the perfect slime. It is sure to keep you or your kid busy. Next, you will need to add your glitter. 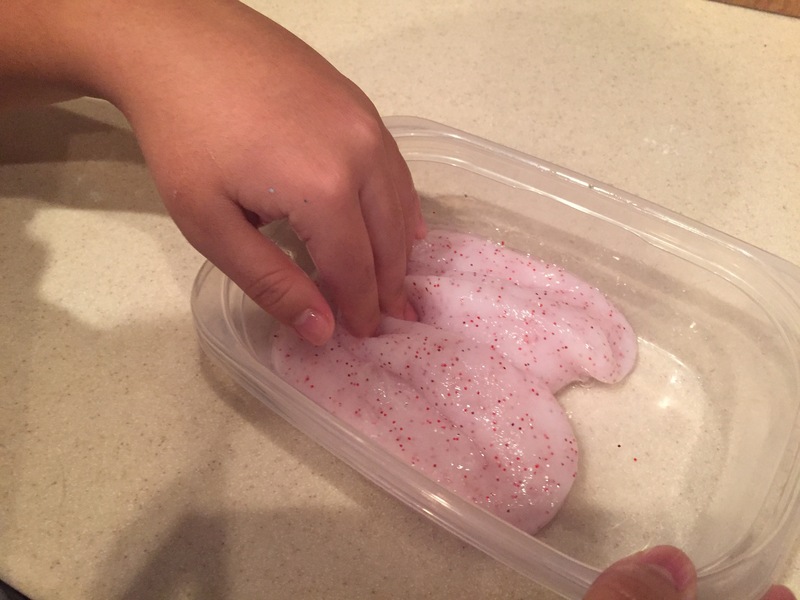 I used red and silver, so my slime ended up being a little pink. I just sprinkled some in and mixed that up. 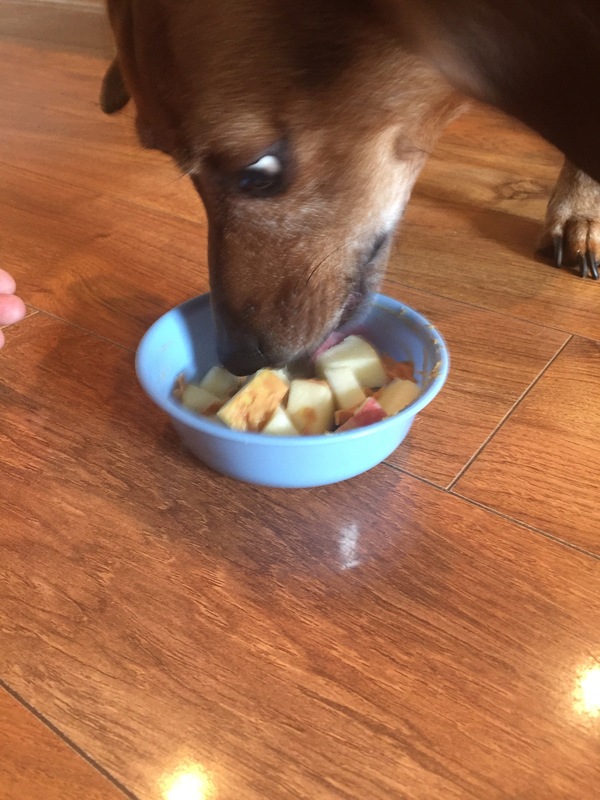 We hear about delicious treats made for you and your family, however, have you heard about the delicious treats your dogs can eat? 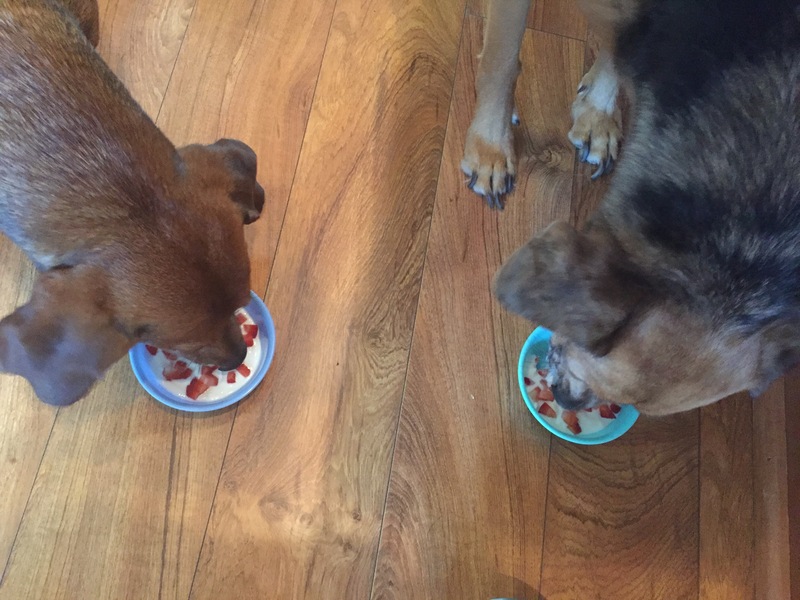 Today, you are going to witness two dog friendly snacks that will get the happy pooches drooling for more! 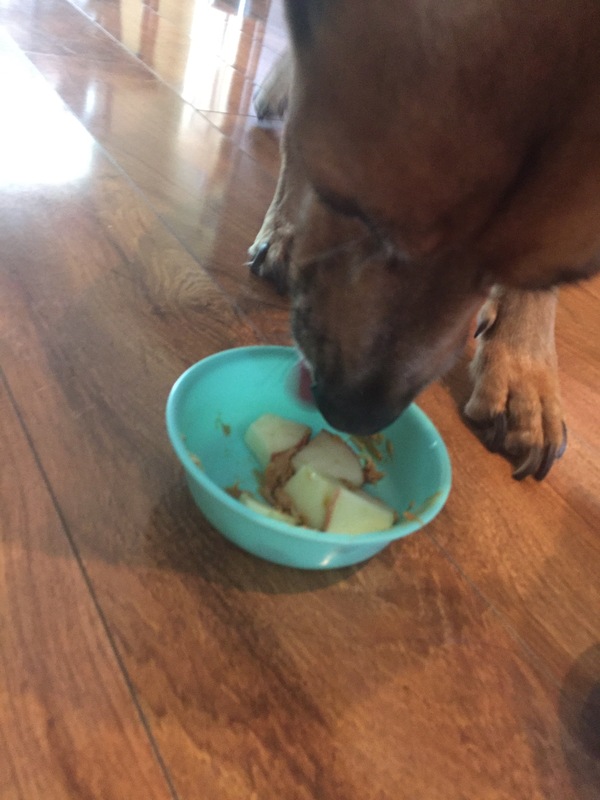 To see the list of human foods your dog CAN eat, please click here. 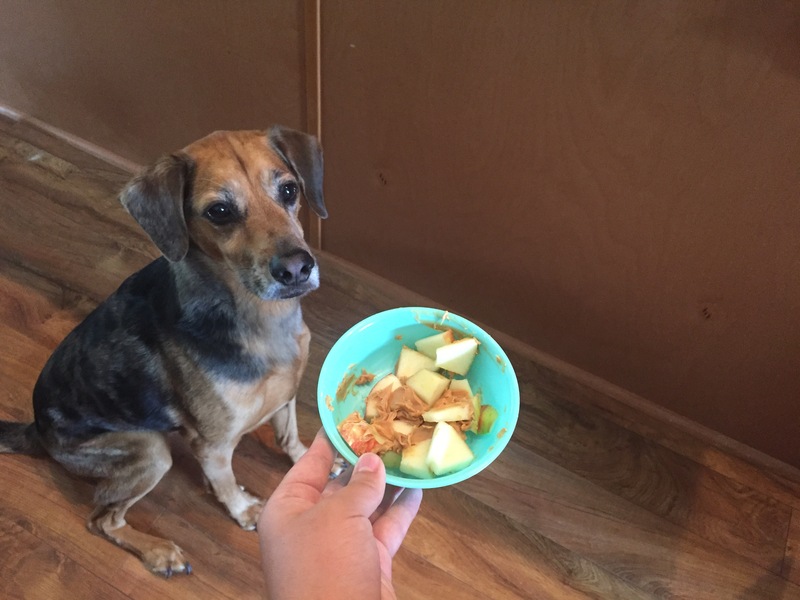 To see the list of human foods your dog SHOULD NOT eat, please click here. Just a little word of advice, before you feed your dog a food you are not sure is safe for them, you should always check the internet first. 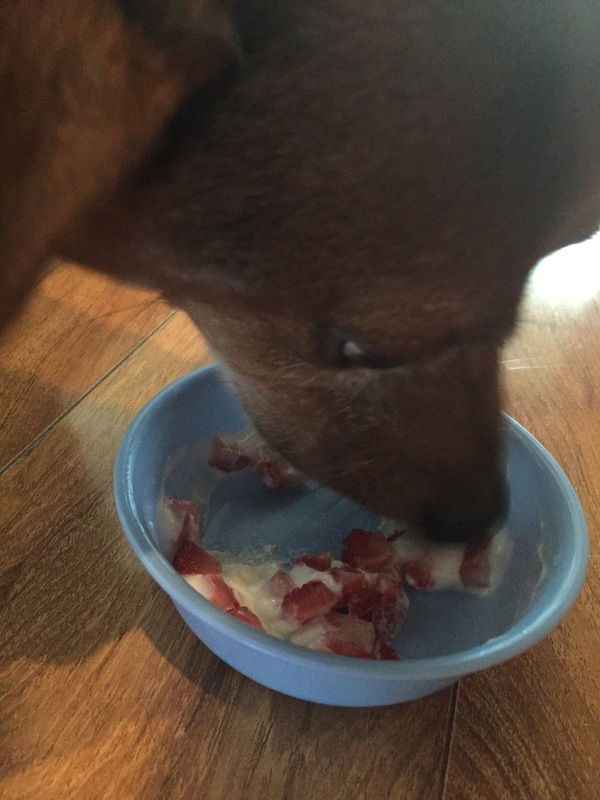 The first dog snack is yogurt and strawberries. 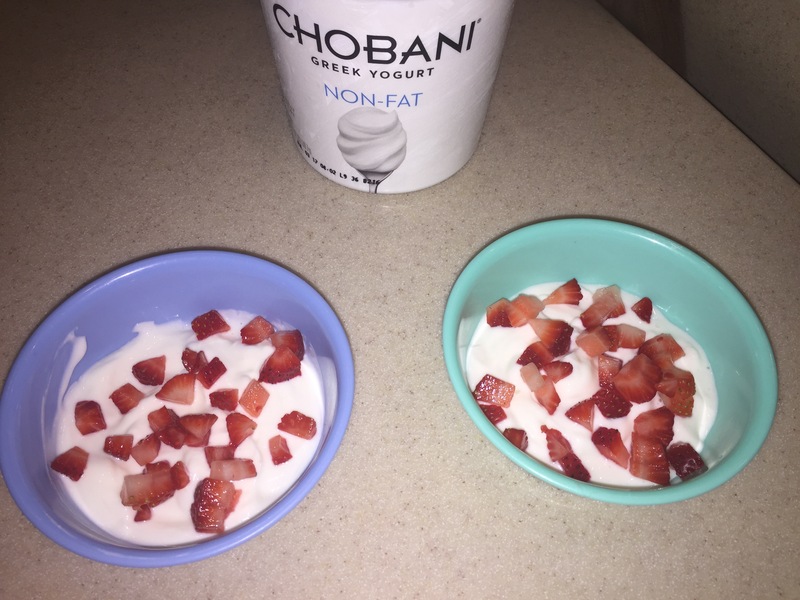 I gathered some Greek yogurt and cut up a few strawberries into cubes. Then, I put the ingredients into the dog bowls and let them eat! 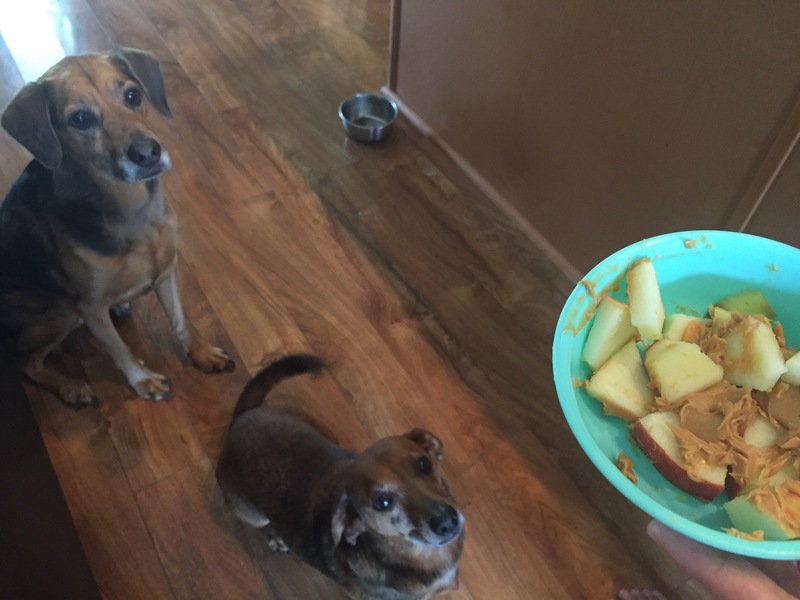 The next treat is apples and peanut butter. 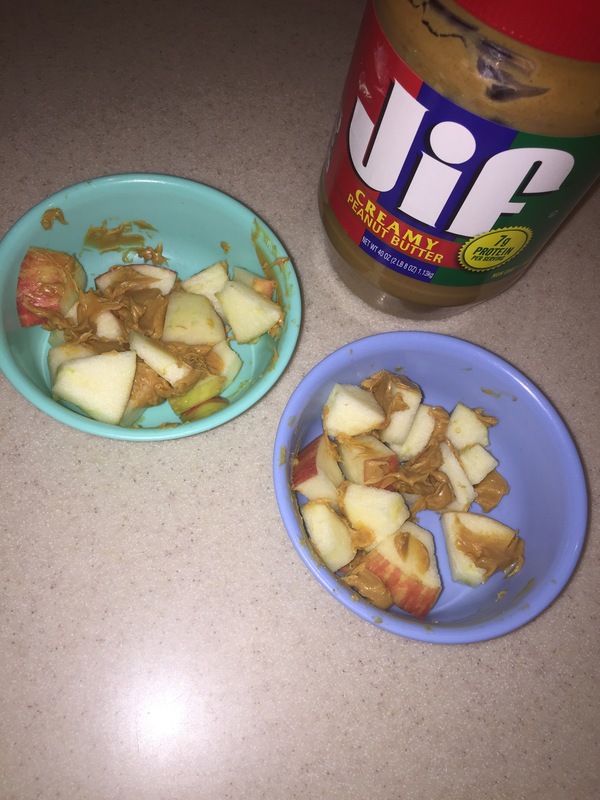 Once again, I got some smooth peanut butter and added a few apple slices to the peanut butter. Then let the pups eat! If you plan on making these easy treats for your pup, please check out the websites about what your dog can and cannot eat, listed above. These will help you know the restrictions to using some of the foods, especially with apples. 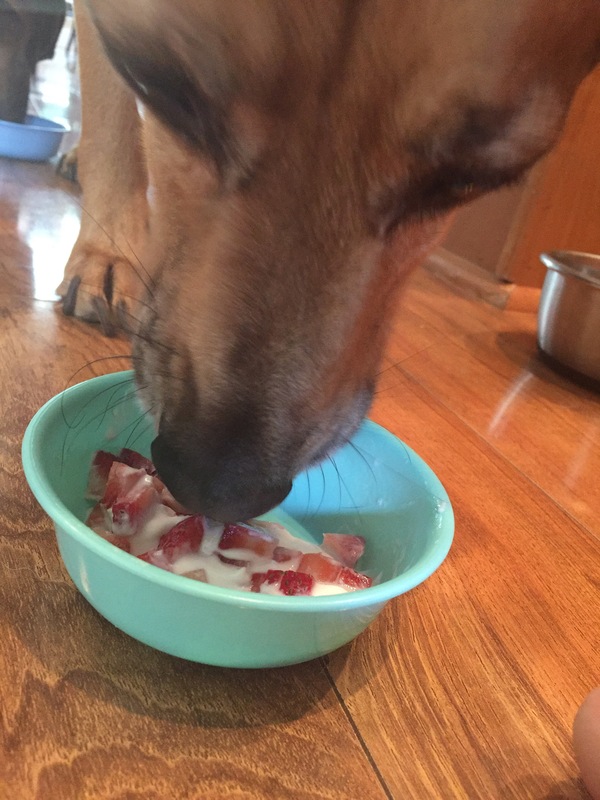 If you noticed, strawberries are not on the list of foods your dog CAN eat, but if you look it up, it is said that they can. 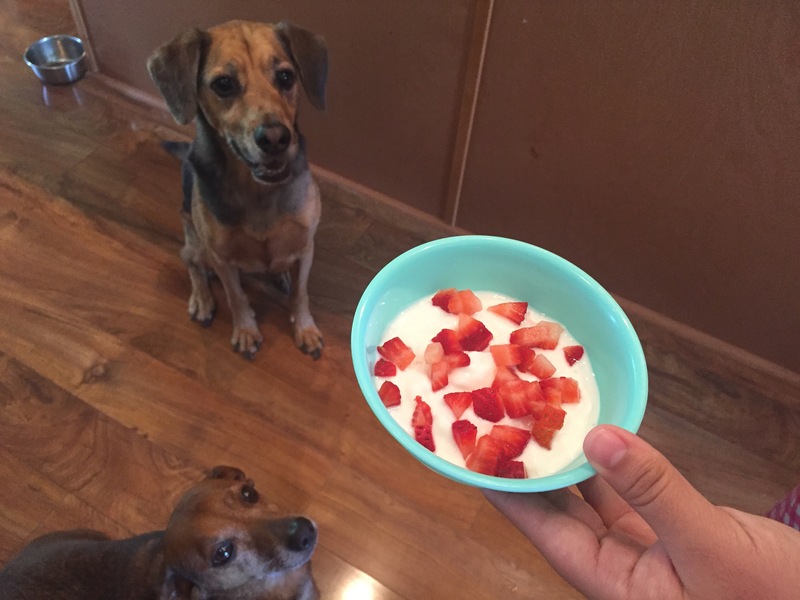 To read about strawberries and whether they are okay for dogs, please click here. Once again, for the safety of your pet please read all of the websites I have listed. I hope your dog enjoys these treats as much as mine did! 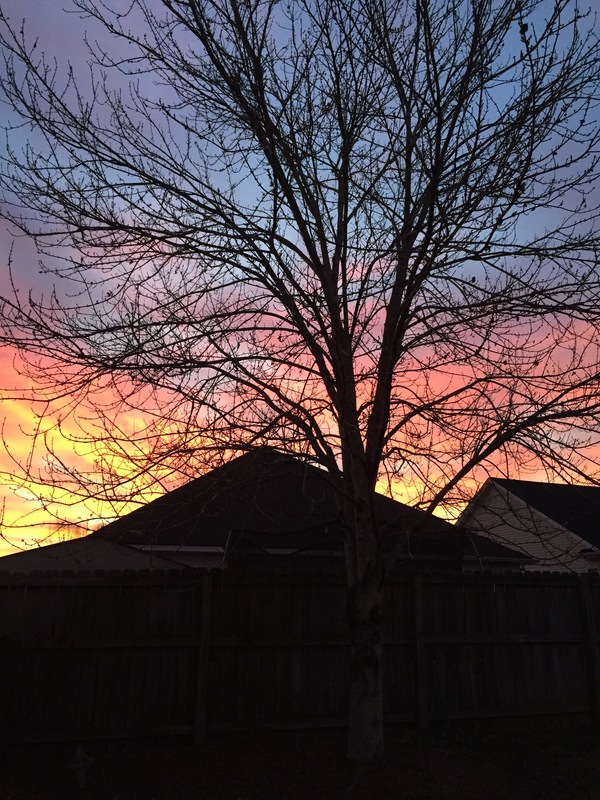 Psalm 19:1 ~ The heavens proclaim the glory of God; the skies proclaim the work of his hands.